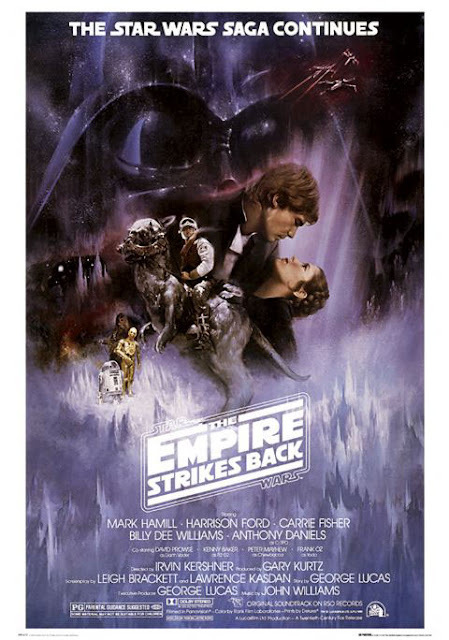 Star Wars Episode V: The Empire Strikes Back opened in theaters thirty years ago today, on May 21st 1980. And thirty years later, it's still the finest chapter of the entire Star Wars cinematic saga. I saw The Empire strikes back in Jan. 1981, only one month before my 12th birthday. My friends and I were fanatical moviegoers and we went to see the movies at least once a week regardless of what was playing. The theater we went to was charging 2 bucks for those under the age of 12 and 3 bucks for 12 and up. My friends, who were both a year older than me, decided to try to save a buck by pretending that they were under 12 years old, but the ticket seller wasnt fooled and demanded 3 bucks from them. Then when it was my turn to buy a ticket, I said that I was under the age of 12 (which I really was!). The ticket seller, after having to put up with the lies of my friends, exclaimed "Oh come on!!! ", and refused to sell me a ticket for the under age 12 price. I was insisten that I really was under the age of 12, but the seller still refused to sell me a ticket. I didnt hvae an extra dollar on me to pay the 3 dollar price. So one of my friends gave me the extra dollar and I reluctantly paid the 3 dollar price. As I entered the theater, the ticket seller snapped at me: "Next time bring your birth certificate!" To which I snapped back at her: "I will!" I never did bring my birth certificate to that movie theater, but over the years I've always toyed with the idea of actually going down there with my birth certificate and demanding a one dollar refund...or else. Unfortunately, that movie theater has long since closed down (a victim of home video and cable tv, like many other theaters). So I never did get that dollar back. That burns me up to this day. Oh, and understand that I'm not into sci fi movies, so the entire movie just sailed over my head. I couldnt understand it. couldnt follow it.